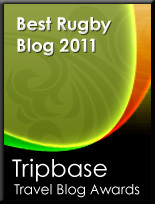 TOTAL FLANKER...a rugby blog: Hall of Fame? Not quite. Hall of Fame? Not quite. The WORLD RUGBY HALL OF FAME is all well and good. In the aftermath of England's 2011 World Cup exit to France, Tuilagi was detained by New Zealand police and subsequently fined £3000 by the England team for jumping into Auckland harbour from a ferry. In September 2013 he issued an apology to Prime Minister David Cameron after making a "bunny ears" sign behind his back during a visit by the British and Irish Lions squad to Downing Street. In May 2015, Tuilagi was convicted of assaulting two female police officers and a taxi driver. English coach Stuart Lancaster subsequently announced that Tuilagi would not be selected for the 2015 Rugby World Cup.